An SNP bid to make sure Britain's exit from the EU was dependant on all four nations voting for it in the referendum has been rejected. During the committee stage of the Referendum Bill, Foreign Office Minister David Lidington said the amendment did "not make sense." The Conservative politician said it was about the UK's membership so it should be about all of the UK taking a view. The UK government will hold an in/out referendum before the end of 2017. The SNP's foreign affairs spokesman, Alex Salmond, moved the amendment on the so-called "quadruple lock" . He said: "In America, 14 states can block a constitutional amendment, even if they comprise only 5% of the population. 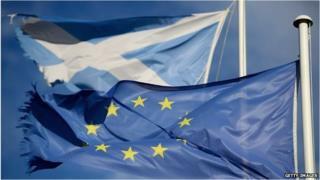 "Even the prime minister, and many of his MPs, would concede Scotland is a nation. The United Kingdom is a multi-national state." Mr Salmond added that the matter was about more than a "simple majority across the UK" and the outcome needed to be respectful of the results in the "component nations". However, Mr Lidington rejected Mr Salmond's argument. Meanwhile, ministers have confirmed that the poll would not be held on 5 May 2016, the same day as elections to devolved parliaments in Scotland, Wales and Northern Ireland. They will also amend planned changes to "purdah" rules, which limit government announcements in the run-up to polls. Ministers said voters must be assured the referendum would be a "fair fight".